Richard Knaster, SAFe Fellow and Principal Consultant, Scaled Agile Inc. Accelerating time-to-market is more than a goal; it's a necessary survival skill in today's digital age. An enterprise's success depends on its ability to quickly create innovative digital applications, products, and services that can adapt to new and evolving business models. DevOps is essential to addressing the challenges of digital disruption. And while DevOps alone won't get you safely through a full digital transformation, the right combination of lean, agile, DevOps, and leadership will. Here's why, and what you need to do to get the mix right. To optimize the flow of value, it's important that all people who are needed to release value on demand work together continuously. 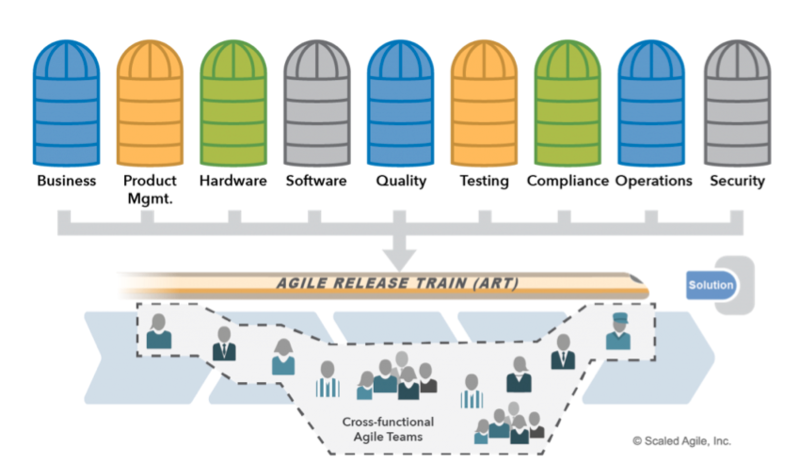 The agile release train (ART) applies systems thinking (Scaled Agile Framework, or SAFe, principle No. 2). And it builds a cross-functional team (more than dev and ops) that is optimized to facilitate the flow of value from idea creation through deployment and release, and into operations, as Figure 1 illustrates. Figure 1. Agile Release Trains are a team-of-agile teams that optimize the flow of value. Each ART is a cohesive virtual organization of anywhere from 50 to 125 people that plans, commits, executes, and releases software together. ARTs are organized around the enterprise's significant value streams—i.e., applications, products, and services. ARTs exist solely to realize the promise of delivering value by way of the solutions for which they are responsible. Therefore, ARTs focus on business outcomes, rather than on the completion of tasks or activities. The ability to release value to customers when they need it and when they want it is critical to any organization's success. It's not just going from code to deployment, but from idea to release. That is why every agile team and ART must develop a continuous delivery pipeline (Figure 2) and DevOps mindset (Figure 3). Figure 2. The SAFe continuous delivery pipeline. Continuous exploration, which fosters innovation and creates alignment on what needs to be built. It starts with an idea or a hypothesis of something that will provide value to customers. Ideas are analyzed and researched, leading to the development of minimal viable products that are evaluated using leading indicators. Continuous integration builds quality into the development process by integrating the ongoing work of the agile teams. All work is version-controlled, and new functionality is built and continuously integrated into a full system and tested end to end before being validated on a staging environment. Continuous deployment takes the changes from the staging environment and deploys them to production. At that point, they're verified and monitored to make sure they are working properly. This step makes the features available in production, where the business will determine the appropriate time to release them to customers. Release on demand is the ability to make value available to customers based on the needs of the market and the business. This dimension focuses on allowing the business to measure the outcome of its hypothesis. Although features flow through the pipeline in a sequential manner, teams work on all dimensions in parallel. For example, one feature may be in exploration, while another is being deployed. approach to DevOps enables the continuous delivery pipeline. Figure 3. 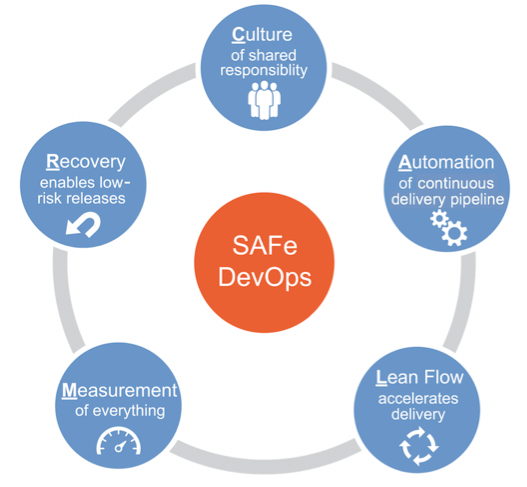 SAFe's CALMR approach to DevOps. Source: Scaled Agile Inc.
Culture represents the philosophy of shared responsibility for fast value delivery across the entire value stream. This includes everyone who contributes to value creation—from concept to cash—including product management, business owners, development, testing, security, compliance, operations, etc. Automation represents the need to remove human intervention from as much of the pipeline as possible to reduce errors, shorten time-to-market, and improve quality. Lean flow covers the concepts of limiting work in process, reducing batch size, and managing queue lengths, which helps make the flow of value to the customer and feedback faster. Measurement is about understanding and measuring the flow of value through the pipeline, thereby fostering continuous learning and improvement. Recovery focuses on building systems that will allow fast fixes of production issues through automatic rollback and "fix forward" (fix in production) capabilities. Achieving any kind of significant organizational change requires effective leadership that takes an active role in implementing this new way of working. As a leader, you must guide the activities to understand and continuously optimize the flow of value. Organize teams around value and continually focus on reducing waste and delays and eliminating demotivating policies. Inspire and motivate others to create a culture of relentless improvement that provides the time and space required for your teams to innovate. Accordingly, as a leader you must have the knowledge and ability to think and act as a lean-thinking manager—a teacher who understands lean thinking and principles and, as part of your daily work, teaches them to others. This is integral to who you are and what you do, affecting every aspect of your approach to helping teams build systems and solutions in a lean and agile manner. Figure 4. Two aspects of lean-agile leadership. The SAFe lean-agile mindset is the combination of beliefs, assumptions, and actions of leaders and practitioners who embrace the concepts in the Agile Manifesto and the SAFe House of Lean. This way of thinking is leadership’s intellectual foundation for adopting and applying SAFe principles and practices. There are two aspects of a lean-agile mindset. Figure 5. The SAFe lean-agile mindset. While DevOps is, indeed, a game changer, it's not enough to respond to market needs in the digital age. Although DevOps fosters a collaborative culture among development, operations, and others across the organization, guidance on how to do so is limited and it often excludes the business. The Scaled Agile Framework fully incorporates DevOps while providing a more holistic approach for organizing agile teams into programs (ARTs) that inherently enact the DevOps culture. Want to know more about how to change mindsets and behaviors and create truly collaborative, agile capabilities that both deliver business value and protect the business from digital disruption? Come to my session, "DevOps Is Not Enough," at the Pink19 conference, which runs February 17-20, 2019. My session takes place on Monday, February 18, from 11:45 to 12:45.